Christ Church Garden is a green oasis off Blackfriars Road, with beds and borders of shrubs, flowers and holly hedging, all under a lush canopy of London plane and lime trees. 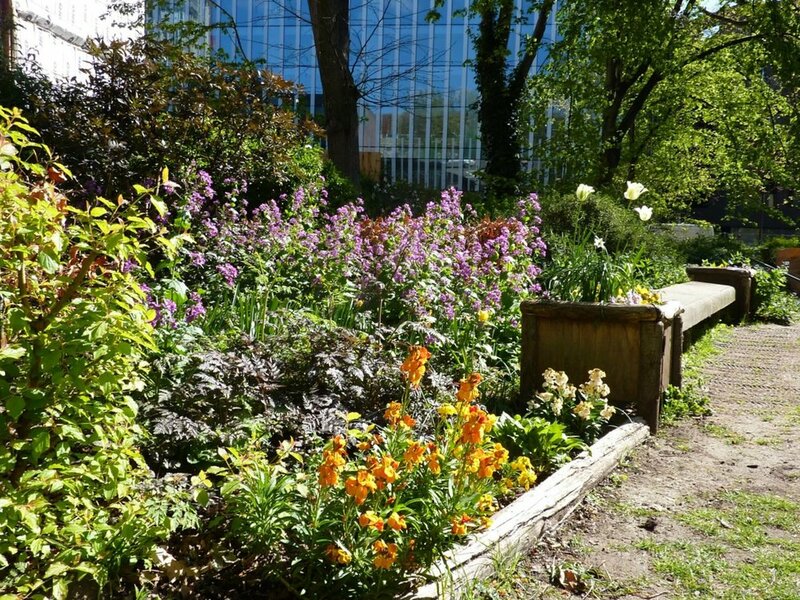 In summer, the space is busy with local residents, office workers and church visitors, and contributes to the `green chain’ of other spaces along the Thames border, including nearby Hatfields Green and BOST’s Waterloo Millennium Green. The gardens is the remains of the much larger medieval Paris Garden mentioned in William Shakespeare’s play Henry VIII. It was redesigned in 2000 under the Bankside Open Spaces Programme (BOST’s predecessor) with local residents, church representatives, Southwark Council, the Metropolitan Public Gardens Association and businesses all working with Marcus Beale Architects. BOST and our Steering Group went on to design further improvements, in particular the wildlife garden border which now edges the park to the north. BOST facilitates an active steering group and works with Southwark Council to ensure the park is well cared for. We strive to involve local volunteers and community groups in planting and maintaining flower beds and the wildlife garden border. We also aim to maintain the peace and sanctity of this green space. As well as undertaking careful planning, events and gardening, this means working with local developers to ensure that any new buildings preserve this special place for all to enjoy. The Wildlife garden and circular bed in the grounds of the Church were created by BOST in 2014 and since then BOST now look after the large front beds. The flower bed shaded under the canopy of London plane trees is the focus of voluntary activity: local businesses, residents, children and community groups help to plant and maintain it. The garden provides colourful displays of spring bulbs and summer blooms with the canopy of the large London plane trees providing much needed shade and rest bite and evergreens in the winter. The garden is a haven for wildlife in this concrete urban environment.